Fairfax County and the Workhouse Arts Foundation are seeking innovative ideas to transform the site into a vibrant mixed-used arts campus. The organizations are looking for cultural, educational, commercial, and other uses to complement the Arts Center’s existing assets. Opportunities could include food halls, restaurants, breweries, entertainment, and more. Read the full announcement below and see how you can submit your great idea! Any questions - please direct to Regina Coyle at 703-324-1214, TTY 711 or Regina.Coyle@fairfaxcounty.gov. 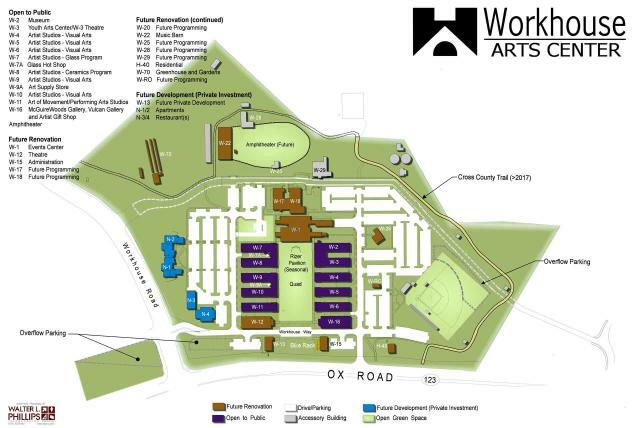 Fairfax County and the Workhouse Arts Foundation are looking for innovative ideas to transform the over 50-acre campus into the first mixed-used arts campus in the county. The county and foundation recently issued a request for expressions of interest, seeking proposed adaptive re-use concepts from companies, nonprofits or individuals. The two organizations are asking for cultural, educational, residential, commercial and other uses that complement the Workhouse Arts Center’s existing studio, gallery and museum spaces. This could include food halls, restaurants, craft breweries, craft manufacturing, housing, arts and entertainment, business incubators and possibly other uses. The goal is to bring greater vibrancy to the campus, enhance it as a regional arts destination, and generate new revenues. The push moves forward efforts to remake this area of Fairfax County into a regional tourism destination for arts and culture. The Workhouse campus anchors the northern end of the NOVA Arts and Cultural District that was created last year with the Occoquan Regional Park and Town of Occoquan. Workhouse and county officials said proposals can include adaptive reuse of vacant or underused space in the 25 historic buildings on the campus that was once part of the former Lorton Reformatory. New construction also can be proposed, along with ideas for the property’s 1.89 acres of green space. Today, the campus contains 25 historic buildings, a large quad, baseball field and nearly 1,000 parking spaces. The Workhouse has restored 11 buildings, using 95,881 square feet as an arts center. It currently consists of six artist studio buildings, a main gallery and the W-3 Theatre. However, officials say proposed ideas that deviate from these existing development approvals are also encouraged with the understanding that regulatory approval will be required. They are looking for the most creative, adaptive re-use concepts to activate the campus. The Workhouse currently supports more than 90 professional and emerging artists by providing them affordable studios and 12 galleries to exhibit their work. Instead of only viewing the art, visitors are encouraged to interact with the artists when they visit. In addition to visual arts, the center is home to performing arts, including: theater, musical theater, film, music and dance with 300 performances per year. It also offers 1,200 arts education classes and workshops in a broad spectrum of art disciplines. Fairfax County owns the campus that was part of the 2,440-acre property that once made up the Lorton Reformatory. The original prison buildings were where the suffragists were imprisoned in 1917 for picketing the White House. Concepts will be accepted from December 1, 2018 through June 30, 2019 and will be reviewed for further action monthly in the order of submission. Concepts presented could lead to a range of actions including but not limited to in-person discussions, lease negotiation and/or formal procurement depending upon the nature of the adaptive reuse concept. Site tours will occur on the 15th of each month from December 2018 through May 2019 at 10 AM, except that a site tour will not be held on April 15, 2019. For more information, review the Request for Expressions of Interest webpage and/or contact Regina Coyle with the Fairfax County Department of Planning and Zoning at 703-324-1214, TTY 711.